Well the weather might not look like it but Spring is here, nearly Summer. So if you haven’t done the all-important Spring Clean you better get going. Open your windows (if there’s not too much rain), let in the fresh air and the dust out. Oh what a great feeling. Here are the hottest tips for giving the house a goold old clean with EcoHip eco friendly products. I start my Spring Clean by cleaning the kitchen from top to bottom, so avoiding chemicals I only use E-Cloths. These amazing cloths clean using water only or nothing if you are just dusting. However, if your surfaces or cupboards are sticky you could add some Citra-Solv washing up liquid. The citra-solv range is amazing and includes all- purpose cleaner and degreaser, dishwasher and washing machine detergents plus a whole lot more. 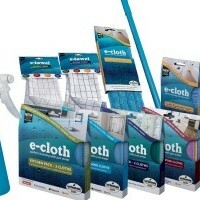 You can also see the E-Cloth range on this site too which ranges from dusters to mops to glass/stainless steel cloths. Just think you can clean your entire house with no chemicals! Click here to browse the collection. I swiftly move onto the playroom, which I only attempt when my daughter is at school or she’d never let me de-clutter anything. Anything broken goes in the recycling, and the toys she has outgrown I give to friends/family or charity. It’s all about recycling as well as clearing out. I do give the toys a dust, it’s amazing how dusty even dolls houses get! If any light bulbs need replacing do this room by room too – I really like the daylight simulation bulbs for my desk lamp and the Plumen for the lounge. The bedrooms always take a long time as I like to tidy the clothes whilst I dust the cupboards. I check for moth holes in the t-shirts and jumpers at the same time. However, since I’ve been using colibri moth repellent drawer and hanging sachets I’ve not really had any. My husband hates me to rid of any of his clothes, claiming he’ll fit into those slim-fitting velvet trousers one day and he might take up the sports that he has the clothes and accessories for – from cycling to boxing, he has it all! On the other hand I love a good clearout – I use the motto ‘if you don’t feel good in it get rid!’ I prefer to have fewer clothes rather than wearing something that doesn’t fit so well anymore or that I’m too old for! Anything too tight or too short has to be passed onto my nieces. My daughter’s room also takes a while because it’s a good opportunity to put away last season’s clothes, make a pile of what she needs to try on to check the size etc. It’s amazing how quickly kids grow out of things! My sister has 3 kids, 2 of whom are older so I get her hands me downs and her baby gets mine, this works out as very good recycling! 4 girls wear the same clothes before they hit the charity shop. I hope your Spring Clean clears your home, head and mind but remember always do it safely using natural products. Visit EcoHip.co.uk for the EcoHip eco friendly products mentioned in this blog and much more. I wanted to add a comment and say that using eco-friendly products for cleaning is a good step towards reducing the impact of pollution, in this case – the use of chemicals that go in to the sewage system or in the air in your house. great article thank you so much ! wjgaaaw,Some really nice stuff on this website, I enjoy it. Thanks for ones marvelous posting! I actually enjoyed reading it, you will be a great author.I will always bookmark your blog and will yusqkyqyd,come back from now on. I want to encourage that you continue your great writing, have a nice afternoon! Thanks a lot for providing us with this recipe of Cranberry Brisket. I’ve been wanting to make this for a long time but I couldn’t find the right recipe. Thanks to your help here, I can now make this dish easily.